Methane clathrate, also called methane hydrate, hydromethane, methane ice, “fire ice”, natural gas hydrate or just gas hydrate, is a solid clathrate compound (more specifically, a clathrate hydrate) in which a large amount of methane is trapped within a crystal structure of water, forming a solid similar to ice. Originally thought to occur only in the outer regions of the Solar System where temperatures are low and water ice is common, significant deposits of methane clathrate have been found under sediments on the ocean floors of Earth. The worldwide amounts of carbon bound in gas hydrates is conservatively estimated to total twice the amount of carbon to be found in all known fossil fuels on Earth. Methane clathrates are common constituents of the shallow marine geosphere, and they occur both in deep sedimentary structures, and as outcrops on the ocean floor. Methane hydrates are believed to form by migration of gas from depth along geological faults, followed by precipitation, or crystallization, on contact of the rising gas stream with cold sea water. Methane clathrates are also present in deep Antarctic ice cores, and record a history of atmospheric methane concentrations, dating to 800,000 years ago. The ice-core methane clathrate record is a primary source of data for global warming research, along with oxygen and carbon dioxide. 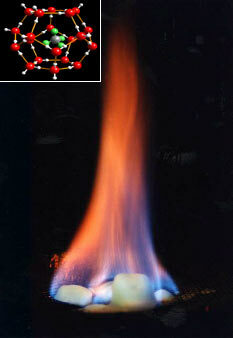 The first successful extraction of natural gas from methane hydrate was acheived by Japan in March 2013. The gas field is about 50km away from Japan’s main island, in the Nankai Trough. Other countries including Canada, the US and China have been looking into ways of exploiting methane hydrate deposits as well. Engineers used a depressurisation method that turns methane hydrate into methane gas. Production tests are expected to continue for about two weeks. Government officials have said that they aim to establish methane hydrate production technologies for practical use within five years. A Japanese study estimated that at least 1.1tn cubic metres of methane hydrate exist in offshore deposits. This is the equivalent of more than a decade of Japan’s gas consumption. Japan has few natural resources and the cost of importing fuel has increased after a backlash against nuclear power following the Fukushima nuclear disaster two years ago. Abstract: The release of vast quantities of methane into the atmosphere as a result of clathrate destabilization is a potential mechanism for rapid ampliﬁcation of global warming. Previous studies have calculated the enhanced warming based mainly on the radiative eﬀect of the methane itself,with smaller contributions from the associated carbon dioxide or ozone increases. Here, we study the eﬀect of strongly elevated methane (CH4) levels on oxidant and aerosol particle concentrations using a combination of chemistry transport and general circulation models. A 10-fold increase in methane concentrations is predicted to signiﬁcantly decrease hydroxyl radical (OH) concentrations, while moderately increasing ozone (O3). These changes lead to a 70% increase in the atmospheric lifetime of methane, and an 18% decrease in global mean cloud droplet number concentrations (CDNC). The CDNC change causes a radiative forcing that is comparable in magnitude to the longwave radiative forcing (“enhanced greenhouse eﬀect”) of the added methane. Together, the indirect CH4-O3 and CH4-OH-aerosol forcings could more than double the warming eﬀect of large methane increases. Our ﬁndings may help explain the anomalously large temperature changes associated with historic methane releases. Abstract: We consider a computational model for the evolution of methane hydrates in subsurface. Methane hydrates, an ice-like compound abundant in subsea sediments and unstable in standard conditions, are an environmental hazard and simultaneously an energy source. Our multiphysics model includes multiphase multicomponent mass conservation equations and several variants of energy balance equation with or without latent heat. We present the technique of model adaptivity which helps to assess and control the two sources of the computational error: the discretization error and the modeling error. The nature and magnitude of the modeling error is strongly dependent on the application and smoothness of solutions. Gordon J. MacDonald Springr Climatic Change vol.16.no.3 Role of methane clathrates in past and future climates. Methane clathrates are stable at depths greater than about 200 m in permafrost regions and in ocean sediments at water depths greater than about 250 m, provided bottom waters are sufficiently cold. The thickness of the clathrate stability zone depends on surface temperature and geothermal gradient. Average stability zone thickness is about 400 m in cold regions where average surface temperatures are below freezing, 500 m in ocean sediments, and up to 1,500 m in regions of very cold surface temperature (<-15 °c) or in the deep ocean. the concentration of methane relative to water within the zone of stability determines whether or not clathrate will actually occur. the geologic setting of clathrate occurrences, the isotopic composition of the methane, and the methane to ethane plus propane ratio in both the clathrates and the associated pore fluids indicate that methane in clathrates is produced chiefly by anaerobic bacteria. methane occurrences and the organic carbon content of sediments are the bases used to estimate the amount of carbon currently stored as clathrates. the estimate of about 11,000 gt of carbon for ocean sediments, and about 400 gt for sediments under permafrost regions is in rough accord with an independent estimate by kvenvolden of 10,000. The shallowness of the clathrate zone of stability makes clathrates vulnerable to surface disturbances. Warming by ocean flooding of exposed continental shelf, and changes in pressure at depth, caused, for example, by sea-level drop, destabilize clathrates under the ocean, while ice-cap growth stabilizes clathrates under the ice cap. The time scale for thermal destabilization is set by the thermal properties of sediments and is on the order of thousands of years. The time required to fix methane in clathrates as a result of surface cooling is much longer, requiring several tens of thousands of years. The sensitivity of clathrates to surface change, the time scales involved, and the large quantities of carbon stored as clathrate indicate that clathrates may have played a significant role in modifying the composition of the atmosphere during the ice ages. The release of methane and its subsequent oxidation to carbon dioxide may be responsible for the observed swings in atmospheric methane and carbon dioxide concentrations during glacial times. Because methane and carbon dioxide are strong infrared absorbers, the release and trapping of methane by clathrates contribute strong feedback mechanisms to the radiative forcing of climate that results from earth’s orbital variations. Arctic methane deposits and Permafrost here on Azimuth. Abstract. Methane hydrates, in arctic permafrost and deep ocean sediments, store vast amounts of methane, which is the primary constituent of natural gas and a potent greenhouse gas. Methane hydrate is a crystaline solid consisting of methane surrounded by frozen water molecules. It is stable in a narrow range of high pressures and low temperatures. Thus, issues aﬀecting the stability of hydrate layers and phase change processes that may disturb this stability are of utmost importance. We present simulations with an isobaric compositional thermal model,based on conservation laws for species and energy, which allows composition, temperature, and pressure dependence of material properties, with thermodynamically consistent treatment of phase behavior via equations of state. Abstract: Slow, constant-volume heating of water ice plus methane gas mixtures forms methane clathrate hydrate by a progressive reaction that occurs at the nascent ice/liquid water interface. As this reaction proceeds, the rate of melting of metastable water ice may be suppressed to allow short-lived superheating of ice to at least 276 kelvin. Plastic flow properties measured on clathrate test specimens are significantly different from those of water ice; under nonhydrostatic stress, methane clathrate undergoes extensive strain hardening and a process of solid-state disproportionation or exsolution at conditions well within its conventional hydrostatic stability field.